What version of Bak Kut Teh do you prefer – soup or dry? Herbal or peppery? My family loves them all. In Malaysia, the herbal ones are more popular whereas Singapore’s Bak Kut Teh is usually peppery. 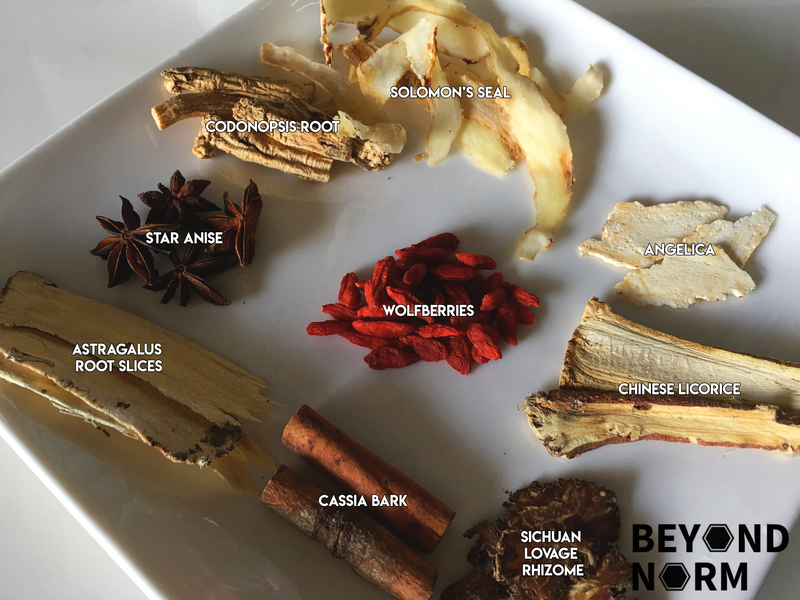 However, if you fancy dry Bak Kut Teh, check our earlier posts: Video and Full Recipe! For a long time, I have been searching for the right herbs and spices to concoct the soup base and finally found one which I have adapted (thanks to Alan of Travelling Foodies). I am so excited to share this new-found recipe with you as there are so much goodness and health benefits in this bowl of soup!! Hope you will try this recipe and be generous by giving us some feedback/comments via our blog. We would also like to welcome you to join our Mummy’s Kitchen Facebook Group for food lovers like you, whether newbie or veteran. You can like us on Beyond Norm’s Facebook Page and subscribe to our blog. Follow us on Instagram and YouTube @beyondnormblog to get the latest updates and videos. 8 pieces fried beancurd puffs, repeatedly rinsed and squeezed out the excess oil and water. Add the ribs into a pot of boiling water and blanch briefly. Remove and set aside. Next add the big bones to a pot of boiling water and blanch for 15 seconds. Remove and set aside. Rinse all the herbs and spices, except the wolfberries, then put them into a muslin bag (if you are using it). In a large pot, add about 10 cups of water and bring it to a boil. Add in the bag of spice mixture and simmer it for about 20 minutes over low heat with the lid on. This will allow the flavours of the herbs to infuse into the water. Add in the seasoning; salt, light and dark soya sauce. Adjust according to your taste and if you prefer a darker coloured soup add more dark soya sauce. 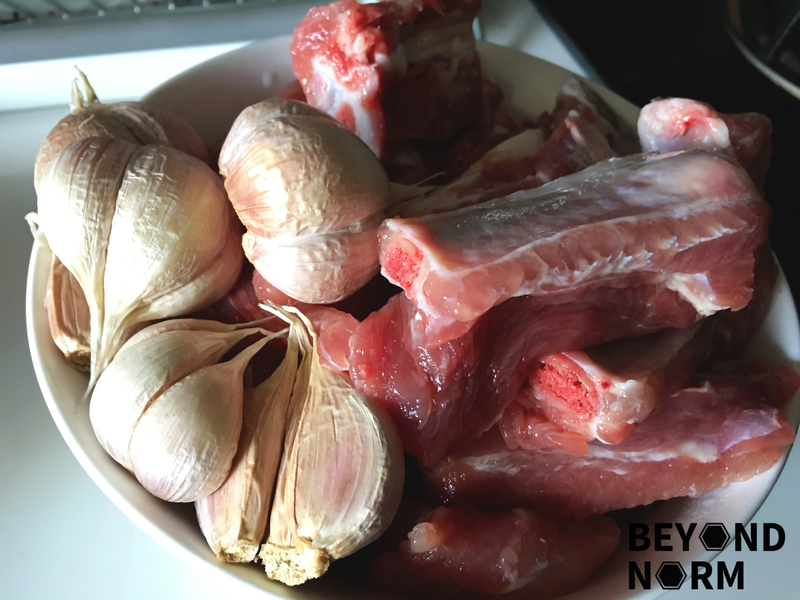 Add pork bones, pork ribs and garlic. Bring to a boil again, then set it to a low flame and continue to simmer with the lid on for 30 minutes. Check if you need more boiling water. Add water if necessary. Occasionally use a ladle or small wired sieve to remove any scum or blood clots on the surface of the soup. This helps to keep the soup clear. Then add in the Chinese mushrooms and simmer for another 50 minutes. During the last 10 minutes of cooking, you can scoop some soup into another small pot to cook the fried bean curd and enoki. Add the wolfberries into the big pot of soup. Serve the Bak Kut Teh with chunks of you tiao and a few Iceberg lettuce leaves, if you like. To spice up this dish, you can make a dip with some chopped garlic, chilli, light & dark soya sauce, and sesame oil.